In every sport, there comes a player, who completely changes the dynamics of how the game is played. For decades in Test cricket, the opener’s role was to fend off the new ball and provide the team with a solid start. The cricketing world saw batting maestros like Sunil Gavaskar and Geoffrey Boycott wearing off quality bowling attacks with their stoic defence and sound temperament. In the 90s, Michael Atherton, Mark Taylor and Gary Kristen continued being the purist’s delight by grinding the opposition with their robust batting techniques. Test cricket required something dynamic which was more appealing to the fans and a much-required break from the orthodox style of batting. At the turn of the century, came an explosive Indian batsman with a reputation of being an explosive power hitter in domestic cricket. He had a fearless approach to his batting and went by the mantra: attack is the best form of defence. Virender Sehwag announced himself on the Test arena with a breezy ton on debut against a quality South African pace attack at Bloemfontein. There was more to follow as the aggressive stroke player grew in stature with each Test innings he played. Once the free-flowing stroke maker got his eye in, he had the ability to score some daddy hundreds. He had the penchant to convert tons into double tons and got 14-150 plus scores for India. Sehwag forged a strong opening partnership with Delhi teammate Gautam Gambhir to end India’s opening woes in red ball cricket. The pair went onto become India’ most successful opening duo in Test cricket. 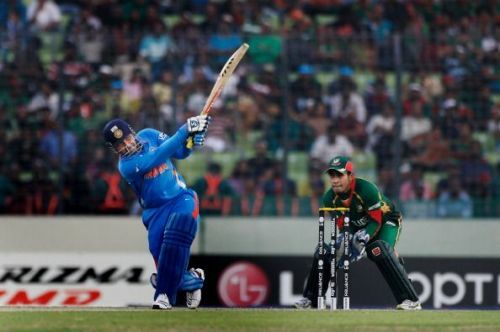 Sehwag was the strike weapon for the Indian batting unit under skipper Sourav Ganguly. He etched a place for himself in a galaxy of batting heavyweights like Rahul Dravid, Sachin Tendulkar, VVS Laxman and Sourav Ganguly to become part of the much famed ‘Fab Five’. Sehwag had pioneered the art of being the aggressor at the top of the order. He defied critics, pundits and devised an unorthodox yet effective approach to opening the batting. The right-hander was well balanced at the crease, did not move his feet much and relied heavily on his superlative hand-eye coordination. His style was a startling contrast to that of the ‘Little Master’ Sunil Gavaskar. In the peaks of his prowess, there wasn’t a more dangerous Test opener than Virender Sehwag. Perhaps Australia’s Matthew Hayden came in as the only major challenger. Despite having batting greats like Vijay Hazare, Gundappa Vishwanath, Sunil Gavaskar, Sachin Tendulkar and Rahul Dravid, Indian cricket lacked a triple centurion in their ranks. 'Viru' scripted history by becoming the first Indian batsman to score a triple ton in Tests. His 309-knock against Pakistan in Multan is an all-time classic which had earned him the title- ‘Multan Ka Sultan’. Sehwag once again showed a glimpse of his brutal strokeplay when he registered his second triple ton, scoring a herculean 319 against South Africa at Chennai. ‘Viru’ only took 278 deliveries to get to the landmark, and in the process, became the fastest batsman to get to the milestone. He missed his third triple hundred just by a whisker when he was dismissed for a scintillating 293 against Sri Lanka at Mumbai. Sehwag was pretty successful as a Test opener on overseas tours. His stellar knocks of 195 and 151 against the Australians, 210 against West Indies in Gros Islet and 105 against South Africa clearly proved that he could score big hundreds against quality fast bowling attacks on seam-friendly wickets around the world. Besides his heroics in Test cricket, Sehwag was one of the most destructive openers in ODI cricket. Opening the batting with Sachin, Ganguly and Gambhir, the free-flowing stroke maker got India off to some fliers with his belligerent hitting. He wasn’t afraid of playing the lofted shots and took the attack early to the opposition. He was a great exponent of the cut shot and deployed the slice very effectively against seamers. Sehwag was known for his quick-fire cameos up the order. He was also a very handy off-spinner too who chipped in with regular wickets for the team. Sehwag was part of three Indian World Cup squads from 2003 to 2011. He played some stellar knocks in the showpiece event. A fighting 82 against in the finals of the 2003 World Cup, 175 against Bangladesh in 2011 and 114 against Bermuda in 2007 are his best efforts for the ‘Men in Blue’ at the World Cups. In 2011, Sehwag produced his greatest ODI knock by scoring a tormenting 219 knock against West Indies at Indore. At that time, he became only the second Indian to score a double ton in limited overs cricket. The swashbuckling opener scored some scintillating tons in the limited overs format. He is best remembered for scoring a 60 ball hundred against New Zealand in Hamilton, the third fastest ODI ton by an Indian. Given the unorthodox yet entertaining manner in which he batted, Sehwag ended his stellar Test and ODI career with really impressive numbers. He scored over 8000 Test runs at an impressive average of 49.3 with 23 tons and 32 half centuries. His runs came at a staggering strike rate of 82 in red ball cricket. In ODI cricket, he finished up with 8273 runs at an average of 35 with a strike rate of 104. Sehwag’s entertaining batting was beyond numbers. He was an outright match winner for India with the bat and a pure entertainer for the die-hard spectators. The ‘Nawab from Najafgarh’ shall arguably go down as India’s most destructive stroke-maker in both Test and ODI cricket.